When a senior citizen is involved in a car accident, it seems people are quick to jump to the conclusion that the age of the driver was a factor. This is a fallacy, as getting older does not automatically worsen your driving skills. However, you should be aware that ongoing changes to your body may necessitate that you make some adjustments to your driving over time. One major item that changes as you get older is your reaction time. 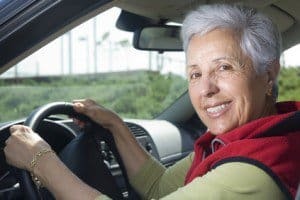 The aging process can cause your attention span to shorten, and create weakened muscles or stiff joints that make it difficult to hit the brakes or move the steering wheel quickly. It is recommended that to avoid the possibility of these issues causing an accident that you leave additional space between you and the car in front of you, begin braking earlier when you need to stop, and when you must drive on a highway, do so in the right hand lane, where traffic generally moves more slowly. Another change you may experience is with your vision. You may become more sensitive to sun glare or have trouble seeing things clearly at night. You could find it more difficult to read the small print on street signs, or find that visual cues that helped you determine your location in the past are no longer working. If you are experiencing any of these issues, you should schedule an appointment with an ophthalmologist immediately for a vision check. Such checks are recommended every one to two years if you are 65 or older. If you are given a prescription for glasses, be sure to fill it and always wear your glasses while driving. If you find you are having difficulty seeing in the dark, even with your glasses, it is recommended you curtail your nighttime driving. Finally, you may notice changes to your hearing. Loss of hearing can be very detrimental to your driving ability, as it increases the difficulty of you detecting car horns, fire truck and police car sirens, or noises coming from your vehicle that could signal a maintenance issue. If you suspect a change in your hearing, visit a doctor to have your hearing checked. This is recommended every three years for people age 50 and over. If your doctor recommends a hearing aid, be sure to use it, especially while you are driving. It is also recommended that you keep the inside of your vehicle as quiet as possible while driving.